Footballer Victor Wanyama seems to be among the many fans who support comedian Pierre Konki liquid. Well, thanks to a video shared by Ommy Dimpoz on Instagram we get to once again witness Pierre showing what he does best. However this time around the comedian got a chance to entertain Victor Wanyama via video call. View this post on Instagram Pierreeee Yuleee LONDON Atiiiii Niniiiii?Ni Mbayaaa Asante @victorwanyama Hatariiiii Fayaaaa Chiiiiii @pierelikwidi #YouAreTheBest A post shared by Ommy Dimpoz (@ommydimpoz) on Mar 31, 2019 at 3:14am PDT Victor Wanyama’s Invite Ommy Dimpoz who is quite close to Wanyama uploaded the video via his Instagram leaving many excited for Pierre whose future seems so bright. Judging from the comedian’s reaction it is indeed clear to see the excitement on his face. Pierre bashed by MP Away from that, this past weekend the Tanzanian comedian faced a few criticism from one Tanzanian politician, Baba Keagan. According to the fella, Pierre should not be given publicity especially since he is an alcoholic; however, what he didn’t know is that Pierre uses this ‘drunk’ personality to entertain fans. 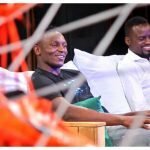 The post Victor Wanyama offers popular comedian fully paid trip to England appeared first on Ghafla! Kenya.